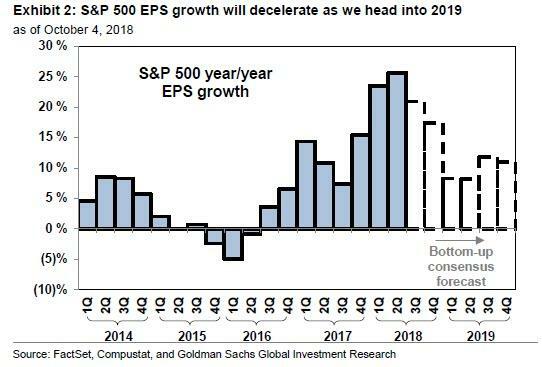 On Monday, in "PPG's Horror Quarter Reveals The Nightmare Scenario For Q3 Earnings" we noted that in his preview of Q3 earnings season, Goldman's chief equity strategist David Kostin said that whereas company earnings will most likely be stellar for yet another quarter, with 3Q EPS for the S&P500 growing by 21% Y/Y, what investors should focus on is company guidance about Q4 and the longer term especially as pertains to profit margins, with Goldman laying out three key risk factors: 1) tariffs, 2) wage inflation, and 3) interest rates. Just 24 hours later, on Monday afternoon Pittsburgh-based coatings giant PPG provided a case study in just how prescient Kostin's warning was by not only reporting a kitchen sink quarter, citing every concern investors have about the macro environment, but also cutting its earnings forecast for the third and fourth quarters of this year. The company weakness was widespread, and touched on all three aspects highlighted by Kostin. "In the third quarter we continued to experience significant raw material and elevating logistics cost inflation, including the effects from higher epoxy resin and increasing oil prices,” PPG CEO Michael McGarry said in a press release on Monday after the close. "These inflationary impacts increased during the quarter and, as a result, we experienced the highest level of cost inflation since the cycle began two years ago. Also, during the quarter, we saw overall demand in China soften, and we experienced weaker automotive refinish sales as several of our U.S. and European customers are carrying high inventory levels due to lower end-use market demand." "Finally, the impact from weakening foreign currencies, primarily in emerging regions, has resulted in a year-over-year decrease in income of about $15 million. This lower demand, coupled with the currency effects, was impactful to our year-over-year earnings and is expected to continue for the balance of the year." In other words between rising costs, slowing Chinese demand, higher inventories, and a strong dollar eating away at foreign sales, suddenly what was the bedrock of US corporate stability is looking extremely shaky. More importantly, as we noted on Monday, PPG was hardly the only company dealing with these stresses, and predicted that many more companies would cite precisely the same litany of concerns in the coming weeks. Fast forward to today when Trinseo fell the most ever after becoming the second chemical manufacturer this earning season to shatter the corporate profit calm - the last pillar of strength below the market - when it warned of disappointing results because of pricier raw materials and slow sales in China. In a statement late on Tuesday, the company said that higher costs for ingredients used to make plastics and synthetic rubber hurt third-quarter profit, as did a slowdown in automotive and tire markets. The China business suffered because of market uncertainty amid rising trade tensions with the U.S., the company said, according to Bloomberg. “We are actively evaluating and taking actions to address these challenges and are working to minimize impacts on our future results,” CEO Chris Pappas said. The warning adds to a litany of investor concerns about materials companies after paintmaker PPG also missed profit expectations, citing the same culprits as Trinseo: raw-materials costs, an automotive slowdown and less trade with China. The Asian nation and the U.S. have been ramping up tariffs on each other in an escalating standoff, and the International Monetary Fund this week cited trade tensions in cutting its 2019 growth outlook. The market reaction was swift and brutal: Trinseo tumbled as much as 18% to $61.66 on Wednesday morning, erasing the year’s gains. It was the biggest intraday decline since the company’s initial public offering on June 11, 2014. The materials sector was the worst of the 11 S&P 500 groups Tuesday, and extended declines for a sixth day Wednesday, dragged lower by Trinseo. Meanwhile, industrials stocks also slid, and the sector was the second worst in the S&P 500 Wednesday. Large multi-national companies including Boeing Co., 3M Co., and Caterpillar Inc were among the biggest laggards, names also embroiled in the trade spat with China. Meanwhile, PPG - which tumbled over 10%, the most in a decade, after its own kitchen sink quarter - gained less than 1% buoyed by the news that Nelson Peltz’s Trian Fund Management has taken a 2.9 percent stake in the paintmaker. This brings us to what we wrote a week ago, when we warned the companies are "suddenly" slashing profit guidance at a record pace. Led by high-profile warnings from Netflix and Applied Materials, the number of S&P 500 companies saying profits will trail analyst estimates outnumbered those saying they’ll beat them by a ratio of 8-to-1 in the third quarter. That’s the most in Bloomberg data which goes back to 2010. "Strong earnings have been the most important factor that has enabled the stock market to ignore the headwinds it has faced this year. If the projection for future earnings suddenly become less bullish, it could/should be enough to upset the balance between the bullish & bearish macro factors that are facing the markets right now." What is troubling is that as sellside analyst projections have remained bubbly, management sentiment slumped in the second quarter according to UBS. Such negative guidance language is likely to accelerate during this reporting season given the uncertainty around trade talks between the U.S. and China, said Keith Parker, the firm’s head of U.S. equity strategy. 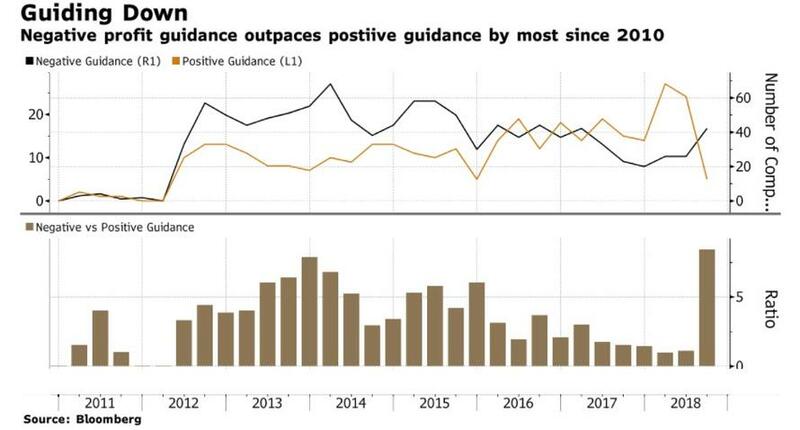 And, if PPG and Trinseo are any indication, merely meeting expectations may no longer be enough; as for those companies who are forced to slash guidance due to what they say is a slowdown on the economy, and impact from the China trade war, the nightmare is just starting.